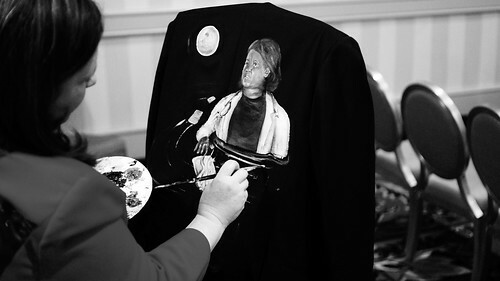 This is story about the jacket painting of TomEvans, MD. If you read Tom’s biography you’ll see many accomplishments in his long career. He has succeeded at so many things. He is President and CEO of Iowa Healthcare Collaborative. He has a BA, MA and MD to his name. He was the Chief Medical Officer at Iowa Health System. He was on the board of the National Patient Safety Foundation and is currently working with HEN’s in the Partnership for Patients Initiative. But today we are going hear about Tom’s failure. Mom became diabetic late in her 50s. Always too heavy and non-compliant with diet, she never took real good care of her diabetic management even though she was a nurse. I think she was in denial. She was a happy, loving mother and the perfect grandmother to our kids. Complications began to catch up with her in her 70’s and by age 77, she had accumulated several medical conditions that made her a prime candidate for the medical system. Her diabetes was a constant challenge in balancing diet and insulin (she ­refused to exercise!). She also developed heart disease. She had a “silent” heart attack (no symptoms) and almost died. After a valve replacement and bypass surgery, she was recovering nicely when the wheels began to come off. As the oldest son and a physician, my role evolved to make sure Mom’s medical needs were met. I found myself moving from a “visiting my parents” to a “making house calls” mentality. I also became quite vigilant for patient safety issues in her care. I saved her life three times from medication safety issues. Twice when in the hospital, she was over-medicated with narcotics. Neither situation required Narcan, but both required significant observation and dosage adjustments. The most dramatic intervention what when my father called me over to their home to evaluate Mom as she "just wasn’t right." I watched her become unresponsive before my eyes and called 911. Before the ambulance arrived I put together that she might have double dosed her insulin. While a normal blood sugar is between 60 and 110, hers was 7. She was having a hypoglycemic reaction and needed hospitalization. The physician taking care of Mom in the hospital requested a “palliative medicine” consult. Because this is usually reserved for patients at the end of their life, I didn’t really think this would do much good. The next day, when my dad and I were called in for the results, we were strongly encouraged to consider hospice placement. Though my mom didn’t have cancer, or some fatal debilitating disease, she had developed “failure to thrive” over the past 6 months…her body just wore out. Her falling, increased weakness, confusion and decreased appetite were all signs of this…and I missed it. The reason her diabetes was under such good control wasn’t that her medication regimen was finally good…it was that she had basically quit eating. When we discussed this situation with Mom in the hospital, and she whole-heartedly agreed. 2) As a society, we don’t do “end of life” transitions well. Often the medical community considers dying a failure, and providers may vacillate between over delivery of care and total disengagement. The patient’s true wishes may not really be considered, and the family is left starved for information and confused. I found myself stuck between the roles of provider and family in this situation, and am embarrassed to note that hospice placement didn’t even occur to me…I was fixing her problems and missed her problem. I wish someone had thought about end of life strategies sooner. I wish I could rewrite the last 8 months of her story for the sake of both my mom and my dad. Do you know what I am talking about? earPlanes are these little earplugs that were created by Cirrus Healthcare products to reduce ear pain when flying. The device consists of a silicone earplug and a ceramic pressure regulator. As a frequent flyer, I use them on every flight. They cost $8.00 a pair and are worth every penny. Before I found out about these nifty little things, I was suffering frequent ear infections post flight and could not hear very well due to ears that would not “pop” for days. This was quite a problem. It is hard to speak well if you cannot hear well. Also as a person with high co-pays and no prescription coverage treating the subsequent ear infections was getting to be quite expensive. I posted my problem on Facebook and one of my friends alerted me to the wonder that is earPlanes. I admit I was somewhat disappointed that my doctor never suggested such an affordable preventive option. (By that point I already spent over 500 dollars on my air flight-induced ear infections.) Perhaps she did not know about this option, so I am blogging about it in the hope that fellow travelers can have a less painful journey. If you read the above paragraphs you might realize why I am writing about Earplanes is not to help Cirrus Healthcare Products. I want to help my friends and fellow travelers. You might also realize there were two brands enclosed in the above testiomony: Earplanes/Cirrus Healthcare Products and Regina Holliday. This post on the meaning of branding was inspired by a cold call request made by Andrew from PM360 Magazine. “I am with PM360 Magazine, a monthly publication for pharma marketers. We also send out a monthly e-newsletter called Panorama. Every month in the newsletter we ask our readers a questions about a new topic, and then we publish the responses we receive in an article in the next month's edition. I thought that this topic might interest you as a patient advocate. Trend Talk: Patients as Brand Advocates? Social media has created a web of readily available brand advocates. For the most part, these are just regular people who are talking about the stuff they like and in doing so are influencing their social circle to also purchase that product. Now, new companies are emerging that are attempting to measure a person’s influence on social media. These companies, such as Klout and PeerIndex, do not only analyze a person’s influence and give them a score, but they work with brands to help them promote their products. For instance, high influencers can be given a discount on a new product or just given a sample to try out. Then it is up to them if they want to tweet or post about it—obviously the brand hopes they like it enough to recommend it. While this model may work for consumer packaged goods companies, is there any way pharma could take advantage of this kind of data and do something similar? What is the best way that pharma marketers can work with patients to improve their campaigns? What are some of the most unique or interesting ways that you have seen pharma companies work with patients to help get their message out there? Email your responses… by May 14. For the most part, we are only looking for a few sentences from each contributor. I thought you may want to contribute something from the patient's point of view. Let me know if you have anything to say on this topic and are interested in responding. Do social media much? The tone of this request is very off if you follow the ins and outs of social media. Klout and PeerIndex were launched almost 4 years ago and that is rather ancient on the internet. Also, I have never seen anyone in my social network utilize Klout “perks:” the commercial tie-ins to brands. I checked out PM360’s internet presence and it is a little sparse for a marketing magazine. They have 134 connections on LinkedIn, 65 page likes on Facebook and on Twitter they have 1,553 followers. I think some of the questionable tone of this request is due to inexperience in Social Media and too much exposure to the traditional group-think in marketing. Most patients in the social media space were just regular people who began to speak out. In many cases they did that out of pain. Just as a cattle’s brand is seared upon his flesh, the patient’s brand is seared upon their soul. The patient may brand themselves with their formal name: Regina Holliday, a modification of said name: e-PatientDave, a created name: Afternoon Napper or the name of the organization they have created: Colontown. They complete this painful process to spread their message be it focused on patient data access, patient empowerment or disease specific research and funding. So the primary brand in such discussions is the brand of self and those in marketing are interested in tagging along for the ride. Well, before you join my crazy life ride; I need to know something about you. I may sing the praises of earPlanes without ever meeting anyone from Cirrus Healthcare (10 followers on Twitter) based on satisfaction of the product. But I bet I would be even more appreciative if I was able to engage in active discussion with Cirrus staff who shared on Twitter. We like to thank folks personally for the good work they have done. When we work on campaigns in social media we expect the support to be like a friendship: it goes both ways. If you want to see a good example of pharma social media look at Lilly Clinical Open Innovation or @Lilly_COI on twitter. They talk with us. They attend our tweetchats. They even wished me Happy Birthday through a retweet last week. @Lilly_COI may not have a ton of followers, but they understand social media is not about using patients. Social media is about working with people. The folks @Lilly_COI have done a great job at helping patients get the patient message out. They attended and helped sponsor The Partnership With Patients Summit in Kansas City last fall and even hosted an unconference session on clinical trials and patient experience. They actively retweeted what patients had to say and helped the conference hashtag trend on Twitter. That is what you meant by “to help get their message out there?” Correct, Andrew? You wanted to know how pharma could help get the patient's message out? Well, those are my thoughts, but I would love for folks to respond to Andrew in the comments section of this blog or on the PM360 twitter account. Thank you Andrew for joining the conversation! Recently my new friend Mindy from Greeting Card Universe emailed to let me know their company not only makes hospice cards; they also make non-traditional Mother’s Day cards. They make Mother’s Day cards for single Dad’s. Which made think about of another non-traditional role: that of the Mother’s helper and the respect we should show them on this day. When my son Freddie entered kindergarten at Murch Elementary nine years ago he made a very special friend named Henry. This quiet calm child was the opposite of rambunctious Freddie but they really enjoyed playing together. Kindergarten was a hard year for Freddie but Henry was definitely the bright spot. So at the end of the year when the other parents were requesting particular teachers for 1st grade, we requested Freddie be placed in the same class as Henry. Throughout third grade Henry and Freddie were great friends, then Freddie went to a special needs school and Henry continued on at Murch. We did not see him often. Then the spring of Freddie’s 4th grade year became a time of sadness, as Freddie’s Daddy (Fred) grew very ill. Many neighborhood families would take in Freddie and sometimes Isaac as well. Several times Henry and his father Tom would play with Freddie and little three-year-old Isaac while Mommy was at the hospital with Daddy. There was a great hole in our life where his love once stood. Freddie and Isaac were so lonely for their father. That summer I would set up so many play dates for the boys. I noticed something very special would happen when Henry came over to play. Isaac filled with joy and Henry who had been Freddie’s friend was now a wonderful mentor for Isaac. I proposed a deal with Henry. He could come over one day each week for an hour and a half a play with Isaac as a type of mother’s helper. He agreed to my proposal and came once every week for his entire 5th grade year. Many children start with the best of intentions when they begin such a task and slowly stop visiting their little friends as life becomes busy and the teenage years approach, but Henry did not fail to visit as the years went by. All throughout the past 4 years Henry has dutifully came over to play with Isaac and Isaac has looked forward to each visit with unbridled joy. Isaac looks upon our move this summer to western Maryland with great anticipation and sorrow. He will miss his Henry. Last week I was in California presenting a speech on a special day for Isaac. He would be performing on stage at his elementary school with his entire class singing a song in French. This was his first school performance and there would be no proud parent to cheer him on. I asked Henry, “Will you go to Isaac’s performance in my stead.” Henry said yes. He filmed Isaac’s short song and he praised Isaac’s performance. Isaac beamed. So this Mother’s Day I would like to thank those wonderful young boys and young girls who are known as Mother’s helpers. Thank you so much. And thank you Henry. Someday you are going to make a great Dad. Kyra Hagan, VP of Marketing at Medseek, afforded me this golden opportunity. Last fall she enquired about the possibility of me presenting at their user group in their April Client Congress. Krya has a personal background that is strongly focused on patient safety and Medseek‘s focus is on patient portals, so I jumped at the chance to speak there. Medseek works with 1,000 plus hospitals in the US and concentrates on website design and portal functionality. Their sole focus since 1996 is patient engagement and they work with many of large EMR companies. They integrate and collaborate and that is music to my ears!! So I could not wait to present at their event! As I was visiting Austin, I reached out to a few dear friends who lived in the area. One was Naveen Rao, whom I met originally at a health meet up in DC. He now lives in Austin and works at Livestrong. He asked me if I would share my story with some of the Livestrong team. He also offered to pick me up at the airport. My flight got in a bit early, so Naveen dropped me off at a whimsical eatery near Livestrong called Hot Mamas. The place was super cool with a lot of original art. I was drawn to a wall that was covered with peacock imagery. Then I sat down to eat one of the best salads I have ever enjoyed. It was so good I even tweeted a picture of it! Four years into twitter and I send my first food tweet. Next I walked down the sidewalk toward Livestrong cherishing the familiar spring foliage. Even the prickly weeds reminded me strongly of my Oklahoma youth. 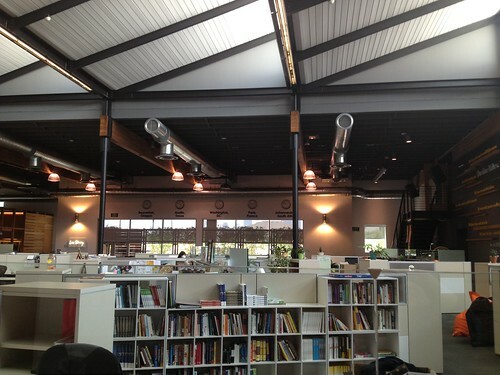 I spoke to the Livestrong folks then I was able to tour their very green facility that boasted a lot of reclaimed lumber. 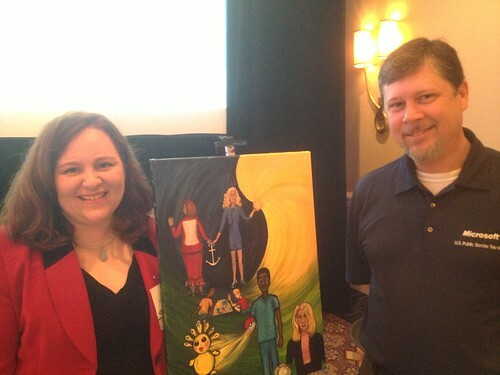 Prior to leaving DC, I also spoke with Walking Gallery member Erin Gilmer, founder of Nebular Health Tech. She mentioned her desire to do a film screening of 73 Cents in Austin. She set up the eventbrite and began promotion, but a week prior to the event lost her screening location. Texas locals Joleen Chambers and Laura Slayton began searching for a venue. I began calling local Lutheran Churches and was so happy that St. Martin’s Lutheran Church near downtown was happy to oblige us! Erin met me that evening on crutches as she had hurt her foot badly and we had a great discussion about health and advocacy during dinner. I thank her for all her hard work putting this event together. We had a wonderful screening and an excellent Q&A. I met so many wonderful people. My twitter friend Camea Kirkpatrick, who is a hospice nurse drove from three hours away to make it to the screening. She is as kind and loving in person as she has been on so many #eol chats. Both Walking Gallery member Laura Slayton and Margaret Crump from the American Nurse Practitioner Foundation were able to make it to the screening as was gallery member Joleen Chambers. One of the new faces in the room was Allison Peacock(which explained my peacock fixation earlier that day…). Allison is one of those delightful people that have triumphed over adversity and balances her advocacy between science and spirit. I am so glad we connected. I was able to thank Robert Aaron from Microsoft for Microsoft's generous sponsoring my Keynote that day. The crowd really enjoyed it and it helped set the tone for the rest of the meeting. 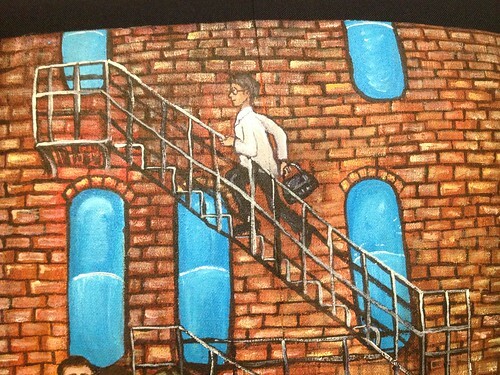 After the speech, I went to my easel and began to paint the content of the meeting room the front of the room. 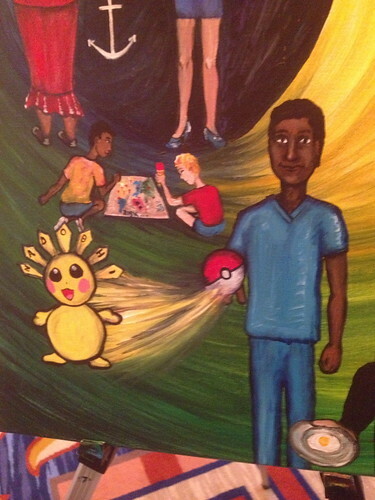 Few conferences let me paint in front, but I always get amazing feedback when I do. Audience members tell me it helped them stay focused and engaged. The next speaker was Leslie Kelly Hall from Healthwise. I have had the privilege of seeing Kelly at many meetings in DC, but have rarely heard her deliver a keynote. She looked so lovely, so fit and healthy in her blue suit I began to paint her thus with a ball of energy within her hand. The energy began to flow as she spoke, and spun around her. Behind her was darkness. The yellow energy and the darkness formed a kind of yin and yang. At the moment I finished that symbol, Leslie (who could not see my work from the stage) said she was speaking about the yin and yang of healthcare. I looked up and then behind me at the people watching me paint while Leslie spoke. We were amazed. Then Leslie shared a poignant story of her Mother’s care. The receptionist at her mother’s doctor’s office told her she could discuss only 4 complaints per visit. Lesley’s mother took that directive very seriously so she did not bring up her shoulder pain. She thought she could deal with the pain. She dealt with that pain until she could suffer no more, and found out much too late the shoulder pain was a point of metastasis. Lesley’s mother died soon thereafter. 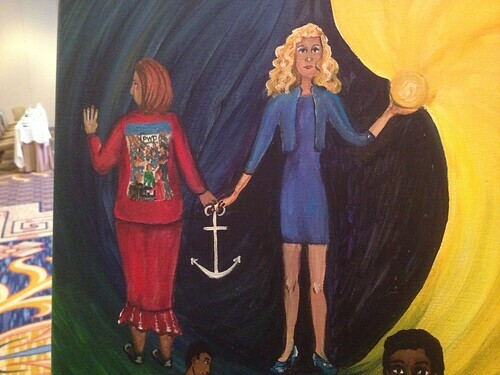 So within the painting Leslie and I stand side by side, I hold up 4 fingers for her mother and we are both anchored in this space with the pain of loss. 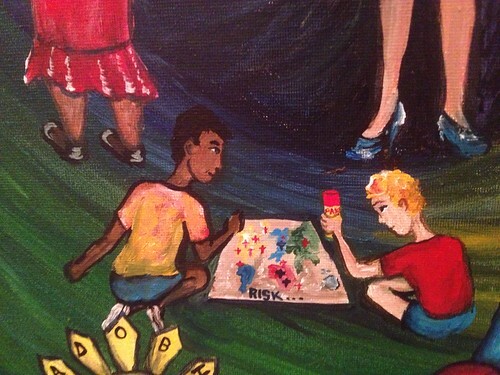 The next session focused on the risk of trying new ways of doing business and I painted two children playing the classic game of Risk while one child hold’s within his hand a can of PAM or patient activation measures to help him win the game of care. Next I listened to a marketing pitch as scrolled the twitter feed and laughed out loud at this tweet and thought it must be incorporated into the painting. 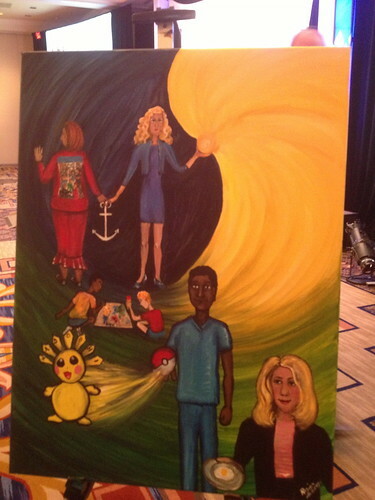 Then I left my painting to attend a session that focused on patient empowerment hosted by Randy Ayers and I saw some great concepts that medseek would be supporting in the coming years. The room was filled with mostly folks who loved data and I chuckled to hear the speaker throw in a subtle over 9000 meme reference. 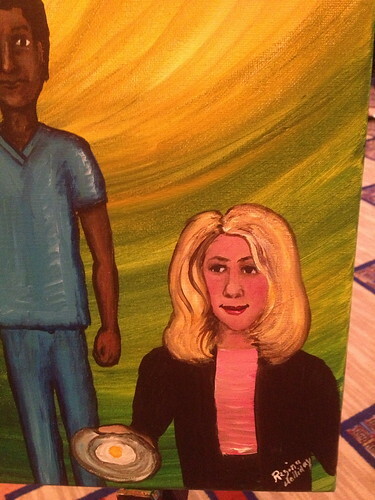 Finally in the far right foreground I painted Kyra holding a plate with an egg upon it. It was an egg for energy, and egg that reminded me of the possibility of Medseek. It was the egg that Medseek fed us rather than and endless table of pastries. 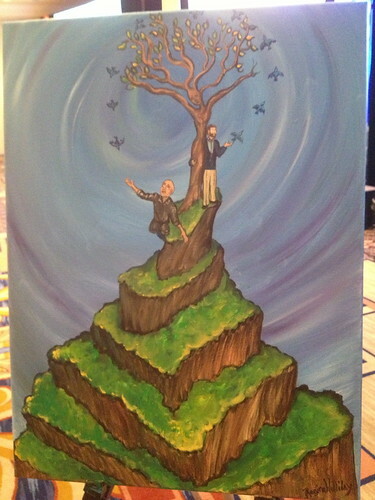 Our two final speakers inspired the painting: Reed Smith and Warren Macdonald. Reed explained the power of social media as it is applied to healthcare. 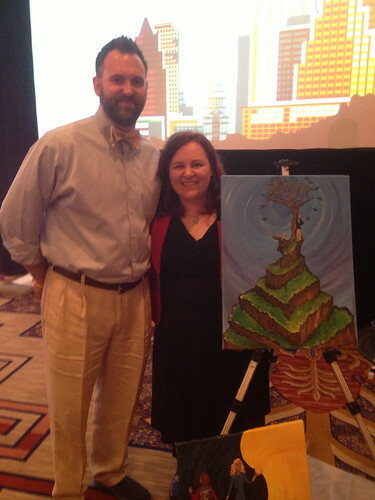 I painted him standing high upon a mountaintop. One hand embraces the tree of knowledge the other lets a twitter bird fly. 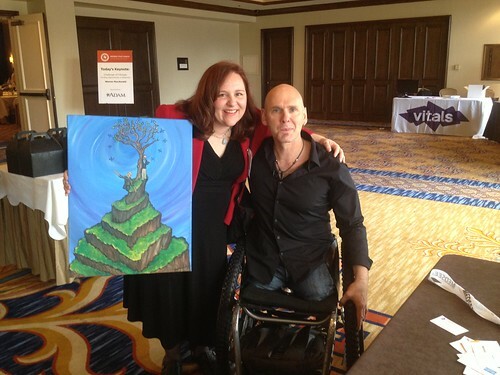 Warren shared his personal story of losing both legs after a boulder on a mountain crushed them. He recounted his long struggle to recover and continue to be the athlete he always was. In the painting he looks up at the message the birds are telling him. So a circuit closes. In this moment we are reminded why we are all here this day. We are here for the patients and they were here all along. 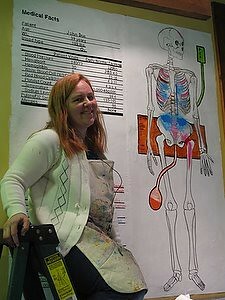 This is my second year painting an image that represents the wonder that is Medicine X at Stanford. 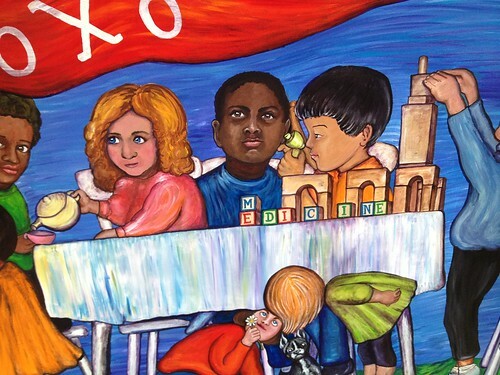 The painting this year is called “Such as These.” The title is a literary reference to the New Testament passage where Jesus chides the disciples for turning away messy and exuberant children. 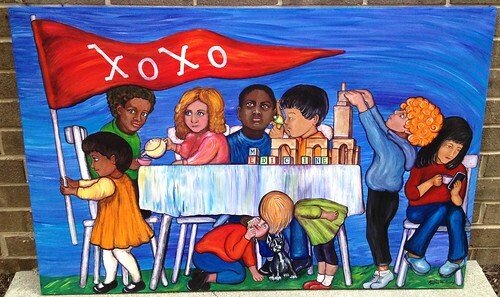 I thought that a powerful concept as we reflect on an event that invites all of us to the table. I focused on children this year. 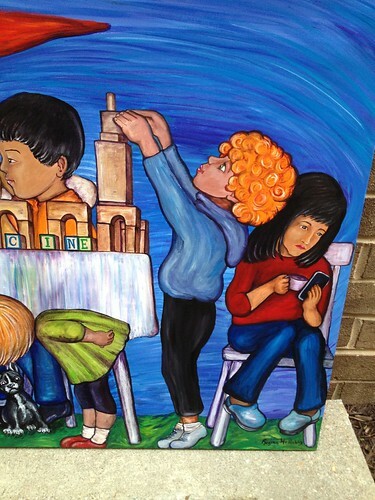 In the world of art, when children are depicted at all, they are often depicted as adults in miniature. But children are far more than that. They are flexible in limb and mind. One moment a child’s face can break with sorrow as tears freely fall and in the next moment a peal of laughter will fill the room. Children show such a range of emotion even though within our culture they are usually depicted as happy smiling creatures. Often in fine art, children are accessories within a composition. They provide a still structural support within a scene and are not the focus of the piece. Here I paint them in all their glory of action and importance, even if their world is considered small compared to our own. So we enter the world of metaphor and the patient becomes the child. For within the world of a medical conference patients are often relegated to this role. We are overly emotional, messy, uninformed, and ignorant; we tend to interrupt our elders. Very often we have special tracks and patient speaker panels that are attended by other patients but very few professionals join us at the children’s table. But if we patients stray within the realm of the professional and like any observant child pick up the turn of phrase and jargon of the world of medicine, if we talk as they do, why then, we are considered “professionalized” and no longer in touch with the common man. What a dilemma for the epatient or patient advocate to face. Not long ago my friend ePatient Dave, or Dave deBronkart as he was once known, shared with me the negative comments a member of industry used when describing my speaking style. The gentleman said I was not real because I cried at the same time in two speeches. Well, try as I might I cannot change the past. It sad every time and most times I cry. But like a child, I can leave the tears behind and within moments focus on a brighter future. Yet this process is painful; each night after the speech my eyes hurt and my soul mourns. I decided to reach out the gentleman who misunderstood me so. It turns out seeing patients enter the world of medicine and lose their authenticity had frustrated him. I explained each person is different, but having lived through a childhood abuse allows me to go from experiencing obvious sorrow to being able to talk about the intricacies of health policy within moments. I told him that being beaten and then having to answer the door with a smiling public face is lesson you do not easily forget. I also said there are patients who cannot return so easily from darkness, but you do not see them speak anymore because this job became too much for such as these. He continued to share his concerns that patients weren’t keeping it real and growing too distant from the source of their passion. I acknowledged his view but stated we each have different ways to stay in touch with day-to-day concerns of regular people. I still work in a toy store and talk of child development and patients rights in the game section. I still do painting with children and introduce them to the concept of participatory art. 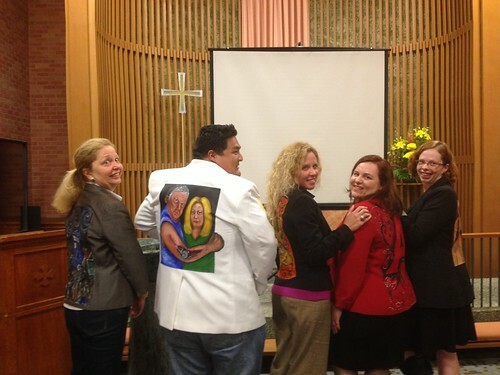 Not to mention with each Walking Gallery jacket I paint, I dive deep within the playground of another patient’s mind. The gentleman apologized for thinking ill of me when he really did not know me. I look forward to having a chance to walk with him again in the future. Apologies are rare within this world and should be cherished, as should be the willingness to talk about hurt feelings. Which brings us back to children and this special painting. Here within the scene a child pours tea for another. The serving child is concentrating on the task and the recipient of the tea looks at the viewer. He or she is an androgynous beauty who looks upon us but also slightly beyond, perhaps focusing on a field of questions that must one day must be answered. To their left a young girl proudly hefts a flag before her that billows in the breeze. 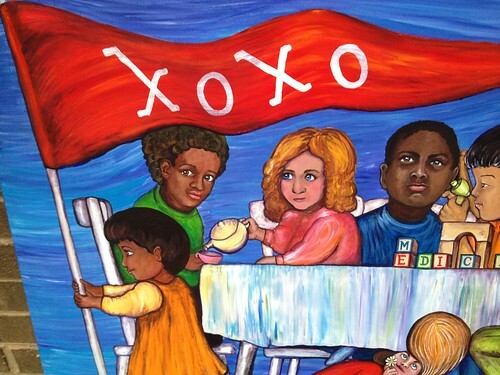 The flag is Stanford red and emblazoned with XOXO, hugs and kisses from this conference to those who will join us at the table. In the center of the composition an African American boy stares into the distance while another child checks his ear with a toy otoscope. The boy’s face holds a fleet of emotions from frustration to concern. His clothing is the same color as the sky and other than his questioning visage he could easily disappear into the background even though he is placed center in this composition. Sometimes we do not see that which is right before our eyes. Below the table a child looks up with a happy smile and offers a flower to her friend as the puppy Zoe completes the tableau. To the right a red haired child stands tiptoe carefully constructing a familiar tower and the word medicine. He only has eyes for the world he is building and his countenance is one of peaceful work. To his right a girl in her skinny jeans holds her teacup as she looks with serious concentration at her smart phone. Which based on her expression, I do not believe is a toy. 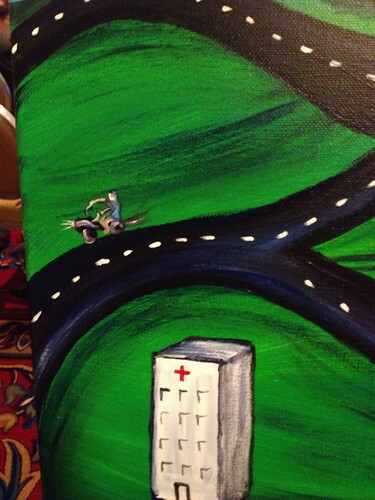 That is the Medicine X painting for 2013. That is the energy and communication of the children’s table. This is a place where tears and laughter meet. This is a place where feelings may be hurt but we talk about it and say we are sorry. Welcome to our table. 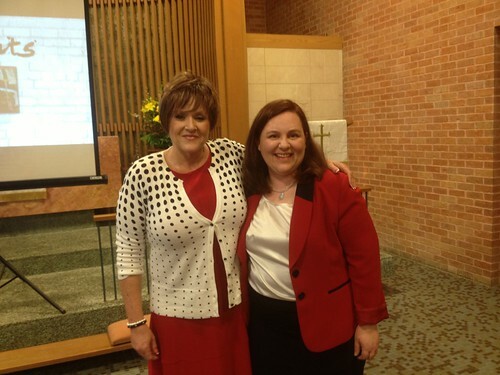 Recently, I delivered one of my favorite types of speeches: a speech with Dr. Ted Eytan! 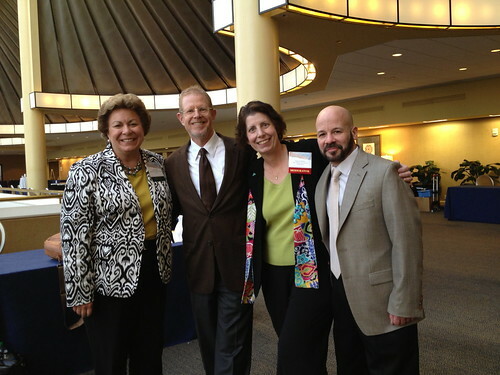 On April 26th, 2013 I delivered a Patient Engagement Panel Speech at The Mid-Atlantic Healthcare Informatics Symposium presented by The Children’s Hospital of Philadelphia or CHOP, as it is known and the Center for Biomedical Informatics, CBMi. We were invited to present by Anthony Luberti, MD, Medical Director, Biomedical Informatics Education at CHOP and CBMi and Mark A. Diltz, ED. D., Manager, Biomedical Informatics at CHOP and CBMi. Did you know I gave my first speech in the world of health on a panel with Ted? It was “Beyond the PHR: Promoting participation at all levels at all levels: internal and external: patient, family, community.” 5th World Healthcare Innovation and Technology Congress, Washington, DC November 2009. The years would pass and we would present together informally at many roundtables and formally on many stages. We would always be so much the better for our collaboration. And just like several speeches in our past Ted came to my rescue at this CHOP event uploading my power point deck through slideshare onto his laptop seconds before I would speak. 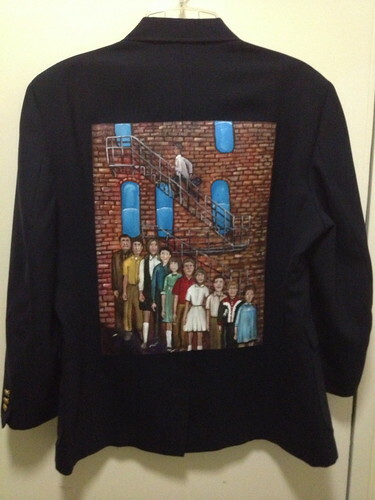 Just as hours before, I would paint the water ripples back onto his Walking Gallery jacket that the two years of constant use had made faint. Ted spoke of patient engagement and environmental stewardship. Our Moderator was Alex Fiks, MD from CHOP with a background in urban pediatric care with a focus on HIT (Health Information Technology) integration. He did a great job of explaining the current HIT landscape. Also on our panel was Daniel Masys, MD. His focus was genomics and he redesigned his power point after seeing mine prior to the event. (That was super cool as I have a high school degree from Sapulpa High School and did a speech that compared toys to data and Daniel is an honor graduate from Princeton with 30+ years in biomedical informatics) His presentation focused on the true ramifications of embracing a learning health system and tracking serendipitous drug response. Can you tell how much I loved this panel? It was a great moment for us and for the hundreds that attended. After we spoke there was a robust Q&A and I was able to share several important points with the crowd. One is that I have signed a Kaiser Permanente HIPAA waiver so Ted is free to talk about me at whatever venue he chooses. I love to remind folks the default in privacy and security is not lack of access, it is asking the patient what they want. Some of us want to share! Secondly, I was able to share the knowledge with audience about Leon Rodriguez and his work in The Office for Civil Rights. The OCR is helping patients who aredenied lawful access to information and ensuring their rights. 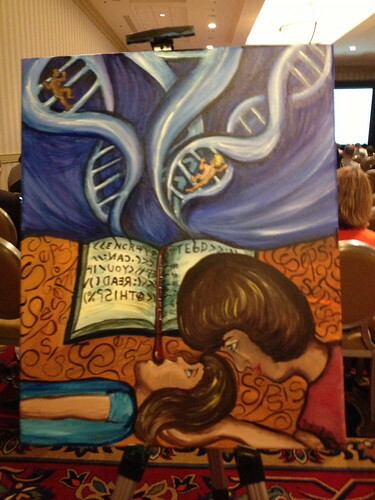 This painting was based on the morning presentations and in large part was inspired by the keynote of Daniel R. Masys, MD. In professorial tone, (I am not talking about a stuffy, somewhat patronizing lecture, but instead that endearing combination hesitancy and passion that an instructor will engage in when he truly loves his topic.) Daniel explained the beauty of genomics and compared it to an encrypted code within technology. 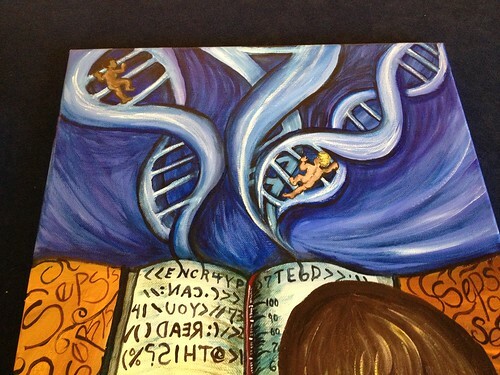 So within my painting swirling curvaceous double helixes arise from within the book of our internal code and small children climb the ladder of time. The lower half of this painting focused on concerns raised in the presentation “Provider Perception of the effectiveness of Early Warning System for Sepsis in and Academic Medical Center.” Here the gold tone background has a lovely etching of black brushwork that one slowly realizes is the word sepsis in constant repetition. A child lies upon this field and what was once a red bookmark in our book of self has become a thermometer reading a fever spike. A mother cradles the child’s head, as she worries. Is this only the flu or something far worse? In the Q&A after the presentation I was able to share information about an EMT pilot in rural Maine that will allow EMT’s to do home visits to complete remote testing. Happily the ambulances there have the ability to test for sepsis via lactate testing. 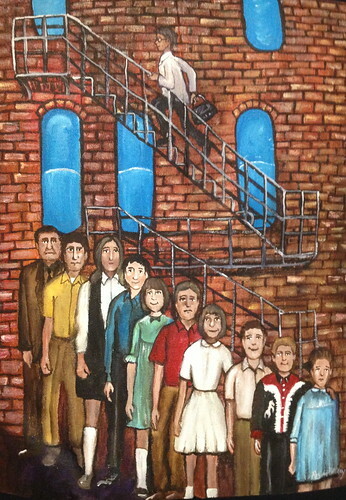 The afternoon painting is entitled “Moving.” It was largely inspired by a hallway conversation I had with Judy Murphy, RN Deputy National Coordinator for Programs and Policy, Office of the National Coordinator HIT. She would be our afternoon keynote. She was telling me about the trials and travails of moving cross-country for her job. She explained the stress of leaving her husband behind in Wisconsin while she worked inside the beltway. We commiserated about the challenges of maintaining care coverage as well as data access during a physical move. As I am moving myself into rural Maryland, I felt her pain acutely. We talked about the need to pack everything and sort later what should be kept and what should go. That is a very strong metaphor for complete patient access to the Electronic Health Record. Let me have my data, let me unpack it and let me decide what can be kept and what should be passed on. 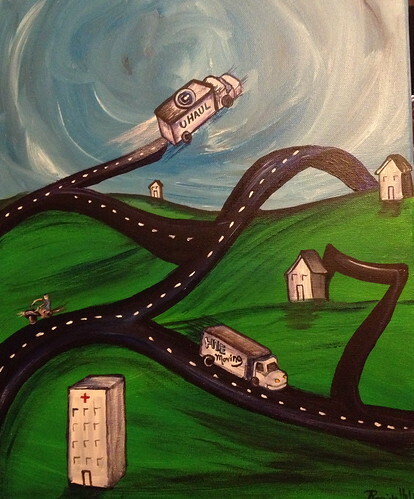 So as Judy Spoke of HIE completion and Blue Button capability, I painted a green landscape with small white houses, a large hospital and the roadway spells “HL7.” Upon the roadways a large moving van has written upon it “HIE moving.” These are the movers you hire; they handle all the details and get your stuff or your data where it needs to go. Flying into “the cloud” is another moving truck. 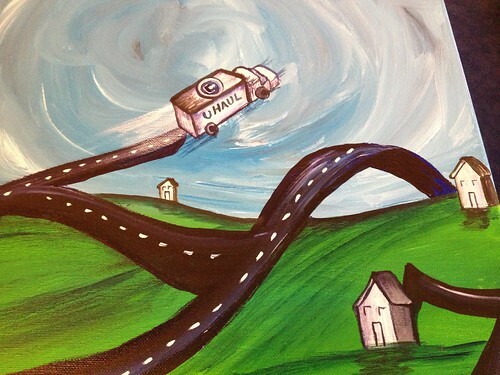 It is an U-Haul with the Blue Button symbol upon it. See some of us want to carry the load ourselves, our reasons may be varied: be they economic or a desire for control, we still want to download and transmit our data or ourselves. So we end a day that started by uncoiling the innermost code of the human cell to focusing on the beginning of a girl like me. I exist because of a motorcycle and a hospital. My father was in a horrible motorcycle accident in the 1960’s. In the hospital he met my mother. They married had three wonderful children. My father was a hard man who often beat us and taught me by force that we must stand up to injustice. So I paint, I speak and share the truth that opens eyes and allows tears to flow. I loved this day and each person I met. The greatest compliment I could ever receive came from many of the attendees as they told me my words were moving. Moving, that is what we must do. Do not stop; do not give up until we get change in this nation. Data must move and we must be able to unpack it. I wanted to post an update in the continuing saga of my request for Hallmark to create hospice cards. At this point the petition has over 4,000 signatureson Change.org. While Hallmark has yet to create a card to fill this gap, Greeting Card Universe has created 24 hospice cards for friends and family of the hospice patient to use. I was overjoyed to hear this! This is another step closer to getting such cards in stores. You order Greeting Card Universe Cards online, but you can pick them up in your local Target store. Isn’t that wonderful? Mindy Rosso-Gaemi, community manager at Greeting Card Universe heard our original plea and decided to do something about it. She created the hospice category and several fields of card types. She then asked her artists to use their talent and life experience to create some cards. These lovely cards are the result. And though it may have not been the intent of the author, this one with “You Are Not Alone” made me chuckle and would warm the heart of any Doctor Who fan. So my friends Michael, Rebecca and Will if you ever enter hospice I am totally sending you this card! 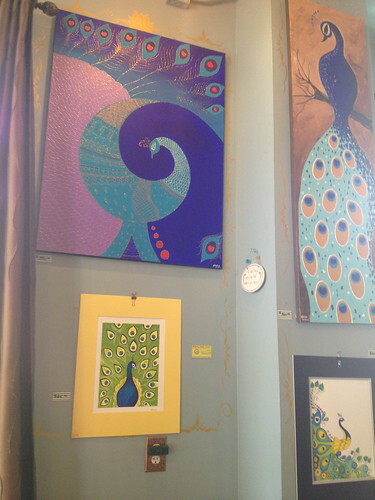 Thank you Mindy and all the artists at Greeting Card Universe for making the end of life a little brighter. San Francisco, CA – (May 1, 2013) – In celebration and support of National Nurses Day on May 6th, Greeting Card Universe, the world’s largest greeting card store, announces its new collection of hard to find and uncommon cards for patients in Hospice Care – affording loved ones the words and sentiments to say a final “good-bye”. “Together with regular nursing duties, hospice nurses provide palliative care to terminally ill patients,” says Mindy Rosso-Gaemi, Community Manager at Greeting Card Universe. “A hospice nurse not only helps a dying patient going through a distressing and often times frightening period, but shows the same level of caring and compassion in comforting the patient’s family and giving emotional and spiritual support when it’s needed most. A special ‘thank you’ card for a nurse or caregiver is a wonderful way to express gratitude to these special individuals”. 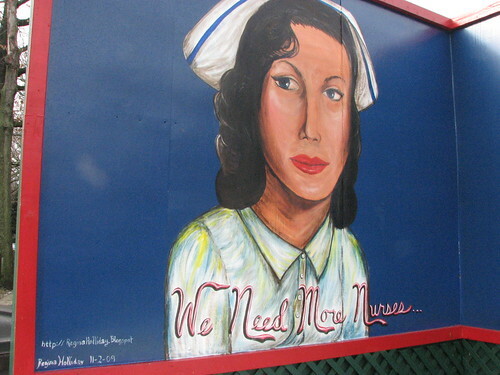 Greeting Card Universe has a popular collection of over 1,000 Nurses Day cards. Hospice care was first established in the 1970s. At the time, cancer patients made up the greatest number of recipients. Today, thanks to advances in medicine, less than 50 percent of hospice admissions are due to cancer. An estimated 1.65 million patients receive hospice care in the United States each year. Greeting Card Universe offers sympathetically designed Hospice Good-bye / End of Life cards created especially to give to hospice patients, providing a starting place for a loving, therapeutic conversation or a final good-bye. The new collection of cards was inspired by the plea of Regina Holliday, artist, widow and healthcare advocate, who publically petitioned Hallmark to create a collection of Hospice End of Life greeting cards. Greeting Card Universe put the request for hospice cards out to their community of 5,900 artists. Within two weeks the new collection emerged with over two dozen cards and more to come. Many of these artists drew upon emotions and experiences of hospice care and their own lost loved ones. The creations carry their tender words of thanks, good-bye and prayer for others to express when the words don’t come easily. Ordering online from Greeting Card Universe’s collection is easy and convenient. An added convenience for last minute shoppers, cards can be ordered online and picked up— usually within one hour—from most Target stores across the country. Explore more uncommon holidays and occasions on the Greeting Card Universe blog. Mindy Rosso-Gaemi is available for guest blogs, radio and TV interviews on this topic and other uncommon occasions and holidays. Greeting Card Universe (www.greetingcarduniverse.com) is a division of BigDates Solutions, a private company that provides consumers with unique, personalized services for any holiday or occasion. Greeting Card Universe is the world's largest paper greeting card store, offering an unlimited selection of custom greeting cards, birthday greeting cards, photo cards, invitations, and note cards. BigDates Solutions is the leading provider of Online Reminder Service Solutions, powering gift-reminder services, including 1800Flowers.com and FTD.com. The company is also the owner of Birthday Calendar, a Facebook application with over 42 million installs.